"Israel should be wiped off the map!" This was the hate-filled war-mongering declaration of some sap in Teheran who calls himself the president of the Islamic Republic of Iran. What map was this sap referring to? 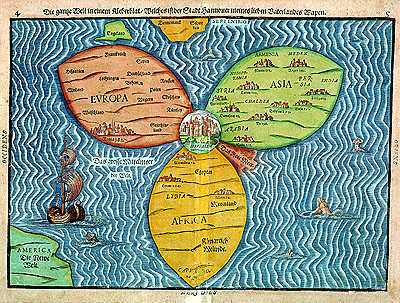 Was it the famous map of the world drawn back in 1585 showing a three-petaled cluster of the continents Europe, Asia and Africa with Jerusalem in the middle as the heart of the universe? Would this Iranic despot wish to remove this heart of the universe and destroy all of mankind just to satisfy his lust for Jewish blood in the same manner that he encourages his minions to blow themselves up in order to kill some Jews? "Woe to the nations of the world who lost something and are not even aware of what they lost. When there was a Beit Hamikdash its altar provided atonement for them but what atones for them today?" Among those seventy nations were ones who actually destroyed the Beit Hamikdash even though it meant losing this source of atonement. Suicide bombers, we thus see, are as old as Babylon and Rome and as current as a Palestinian terrorist and an Iranian sap. While we are on the subject of maps, there is a charming parable worth reflecting on. The father of a very bored child found himself at a loss how to entertain his son with no toys or puzzles at his disposal. When he saw a map of the world in the religious weekly magazine he was reading, he was struck with a brilliant idea. He carefully cut this map into individual countries, mixed up the pieces, and challenged his son to put the pieces together in proper fashion. The youngster was able to put together Israel and Jordan and even the US and Canada. But the rest of the world was too much for him. He was about to give up when one of the pieces in this unique jigsaw puzzle turned over. When he saw a hand appear his curiosity was aroused and he began turning over county after country. It soon became clear to him that on the other side of the magazine page with a map of the world was a man doing something. Although he was not educated enough to know where every country belonged on the map, he knew what a man looked like. He quickly assembled the pieces from which emerged a picture of a man looking into a book and studying Torah. He then turned the page over and proudly announced to his father: "Look Abba, Ive put together the world!" Our Talmudic Sages repeatedly remind us that the Creator of the world, about Whose creation we read in the Torah on the first Shabbat following Sukkot, made a covenant with heaven and earth that they would remain in existence only as long as Jews would study His Torah. This is a perspective, which is tragically ignored even by some of our own Jewish leaders who view Torah scholars as parasites rather than as the pillars of their existence. The Jewish nation which gave life to the world by receiving the Torah, and whose members sustain the world by daily studying that Torah, can never be "wiped off the map" because they are the heart of the map which gives life to all the pieces on it. It is that sap in Iran and all the saps he sends to plant bombs in civilian centers, requiring Israeli sappers to safely detonate them, who must be wiped off the map of the world they wish to destroy. No saps, no sappers and Israel and the entire world can enjoy peace.